What Is Pediatric GERD and How Can You Treat It? About one in five babies are excessively fussy (often called colic). Babies may cry for many reasons, but the latest research suggests that at least 40% of these fussy kids may actually be suffering from GERD. Acid reflux in babies is common for a few reasons: a baby is on an all-liquid diet; the sphincter at the top of her stomach is still loose; her stomach is slow to empty; and she spends a lot of time on her back, making it easy for tummy contents to slosh at least partway back up the esophagus. In otherwise healthy babies who are growing well, acid reflux isn’t a serious problem. But a baby who has a looser-than-average sphincter, a tummy that empties more slowly than usual or a food allergy may develop gastroesophageal reflux disease, or GERD. Acid can irritate the lining of the esophagus, making it tender, red and swollen. Babies with GERD may cry for hours, arch their backs in pain and have difficulty gaining weight. Sufferers could also develop wheezing, a chronic cough or recurrent pneumonia. A few even have apnea, or pauses in breathing. I start by considering food allergies, which occur in about 5% of all babies but are present in about 60% of babies with reflux. The most common culprits are cow’s milk and soy proteins in formulas. 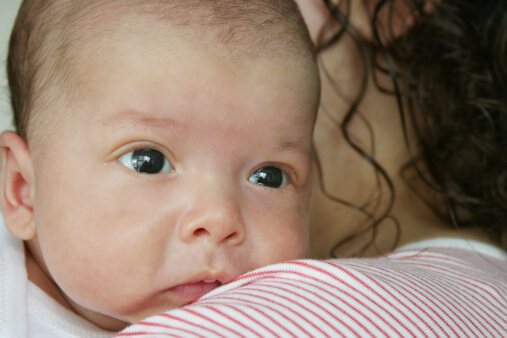 Less commonly, foods in a mother’s diet, such as cow’s milk, soy, eggs and peanuts, can trigger reflux in breastfeeding babies. Before recommending medications, I ask breastfeeding moms to stop eating these foods to see if this resolves the problem. I suspect that tobacco, coffee or caffeine in breast milk or secondhand smoke can also worsen reflux in babies. Decreasing the volume of milk and increasing the frequency of feedings may reduce reflux, and thickening your baby’s bottle feedings with one tablespoon of rice cereal per ounce of feeding is an option to be discussed with your physician. Some studies suggest that this decreases both spitting up and crying in babies with reflux; other studies do not agree. Adding rice cereal does provide extra calories, and it could make it harder for babies to know when they’ve had enough to eat. Because reflux is usually a mechanical problem, positioning is an important part of treatment. When your baby is awake, carrying him upright or placing him on his tummy can help. Elevating the head of the bed and using a Tucker sling may also decrease reflux. A number of medicines can treat GERD. Although side effects are uncommon, these can be strong medications that alter the normal secretions of the stomach wall’s cells. I agree with thoughtful use of medication, but it should be distributed with discretion. Even as you consider the options for treating reflux, your baby is already busy doing the real work. Silently, his muscles mature and coordinate. A great majority of babies with reflux cure themselves, often by seven months old, with nothing but a bit of time and some thoughtful, gentle relief.